I love my iPad, and with the iPad 3 rumoured to be fast approaching, Apple is still on a high in the tablet market, controlling the lion’s share of sales, and having turned around what was seen as a ‘cool concept but impractical’ and roundly plundering the netbook market it’s brought us a handy and cool way to consume media anywhere. But as Apple created the smartphone and slowly lost it’s majority market share, the iPad will do the same and 2012 will be the year the Android tab, took over. The iPad still remains the market leader. Apple’s revolutionary and iconic iPhone is still seen as very much ‘the’ smartphone, however with Ice Cream sandwich and more and more sleek Android devices coming on the scene, it’s now seen as the high-end niche phone. While the iPad continues to dominate the tablet market, we’ve seen some interesting contenders over the past year, from the Sony S to the Galaxy Tab. Most interestingly perhaps, is the Kindle Fire. While nowhere near the iPad in terms of specs and features, the Fire is cheap, handy and takes advantage of the trusted Amazon marketplace. Shipping over 1 million units each week in the run up to Christmas, cheap Android tablets may see the iPad taking a similar place to the iPhone. The Fire’s big advantage is that people shop so regularly on Amazon, they’re already set up on every service they need, and know and trust these offerings from the online retail giant. Up until now, Android has been hampered by endless updates and a slew of devices, which have had serious hardware problems (Motorola Xoom, Dell Streak and many more), making the iPad the simpler, more refined choice. However, with Ice Cream Sandwich being a very much more refined and simple OS than previous Android versions, and high-profile companies like Sony, Samsung and Amazon getting involved, we’re beginning to see a new generation of devices which appeal to the mass market, while carrying a certain style of their own. 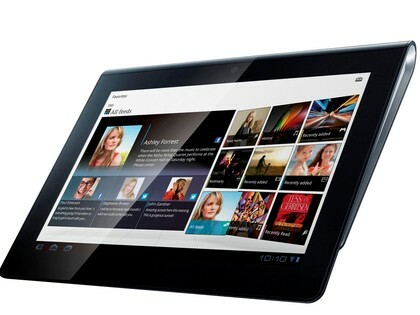 The Sony S has lots of custom features like Playstation and the Sony Movie store. One big thing that Android allows is customization of its OS, unlike Apple. Companies like Sony have added in Playstation features to appeal to the large gaming market, while Amazon have added their own Film, Music and book store to take advantage of their huge customer base. While iOS does allow some of this through various apps, the simplicity and appeal of having these natively cannot be under-estimated in their appeal to consumers. The iPad certainly isn’t going into obscurity, much like the iPhone it may lose out on its overwhelming market-share, but it will very much so, still be seen as the best on offer while Android continues to mature. The mistake industry people tend to make is to label something as an ‘i-killer’ when in reality, no single Android device can kill the iPhone or iPad, but the flood of low to high-end options can. What this means for us, the customers, is a wide range of tablets getting better and better, with more features with every release.